Chris Plonsky, Women's Athletics Director at The University of Texas at Austin, interviews David Booth about the James Naismith’s “Original Rules of Basket Ball.” In 2010 Suzanne Deal Booth and David Booth purchased the document, which is currently on display at the Blanton Museum of Art. Photo by Pete Smith. Janine Barchas, Associate Professor of English at The University of Texas at Austin, brought students from her class "The Paperback" to visit the Ransom Center for a Halloween show-and-tell. Students in the class dressed in costumes inspired by various paperback imprints. Photo by Pete Smith. Members of the Ransom Center's staff dressed up in costume for Halloween. Photo by Richard Workman. Author and futurist Bruce Sterling tours the exhibition “I Have Seen the Future: Norman Bel Geddes Design America” before his keynote talk at the 2012 Flair Symposium “Visions of the Future.” Photo by Pete Smith. There are many factors to consider when housing very large collection objects. 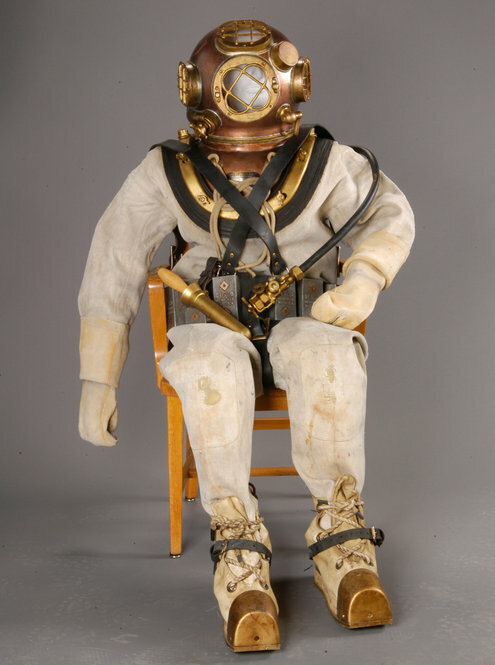 This was particularly true in the case of the deep sea diving suit worn by Cuba Gooding Jr. in the movie Men of Honor, which came into the care of the Ransom Center when Robert De Niro donated his archive to the Center in 2006. 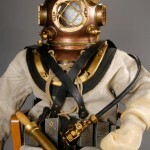 The mandate was to create a storage device to increase the longevity and preserve the construction of the suit. 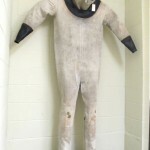 The dive suit was too large and too heavy for housing in conventional preservation boxes, and flat storage could not have properly supported the suit’s own material from crushing itself. 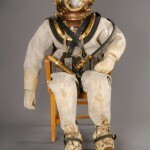 The amount of storage space had to be considered, along with the construction of the support device, so the suit could be easily transported and exhibited. 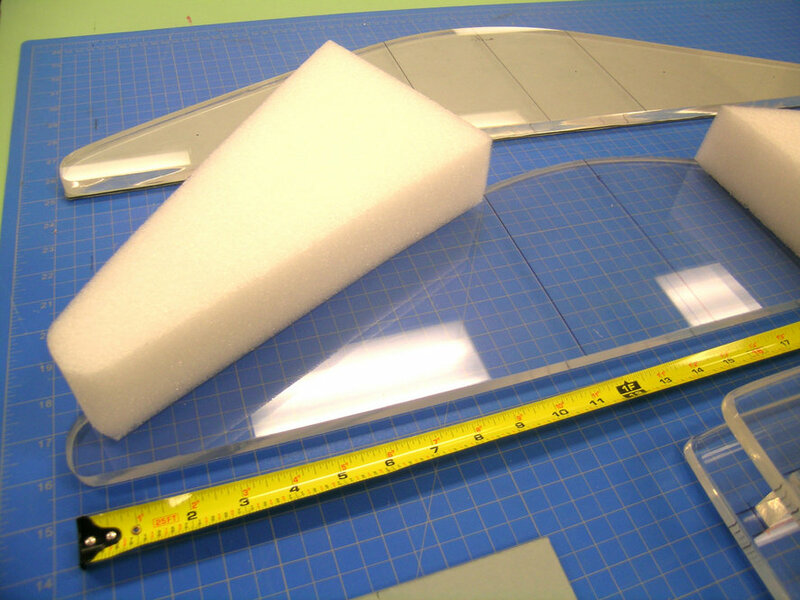 This dictated that the type of materials used to construct the device be archival and light weight, such as acrylic sheet and polyethylene foam. The solution was a hanger designed to be simple, adjustable, and adaptable. 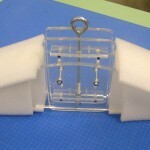 The main body and structure of the hanger is 1.25 cm thick acrylic sheet. 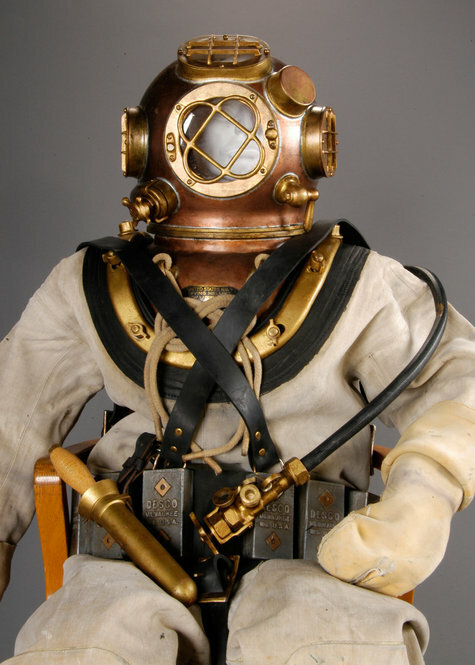 It was measured to fit the exact shape of the interior of the deep sea diving suit across the shoulders and into the arms. The acrylic sheet panels were cut, drilled, and polished, then bolted together with two thick polyethylene foam planks placed between them. The Ethafoam serves as lightweight, highly compact archival filler. It also provides a porous surface to which layers of Ethafoam padding can be hot-glued to cover the surfaces and edges of the acrylic sheet and the bolt heads. The central neck panel is also constructed from acrylic sheet, and screwed together to form an adjustable sliding block that is removable. 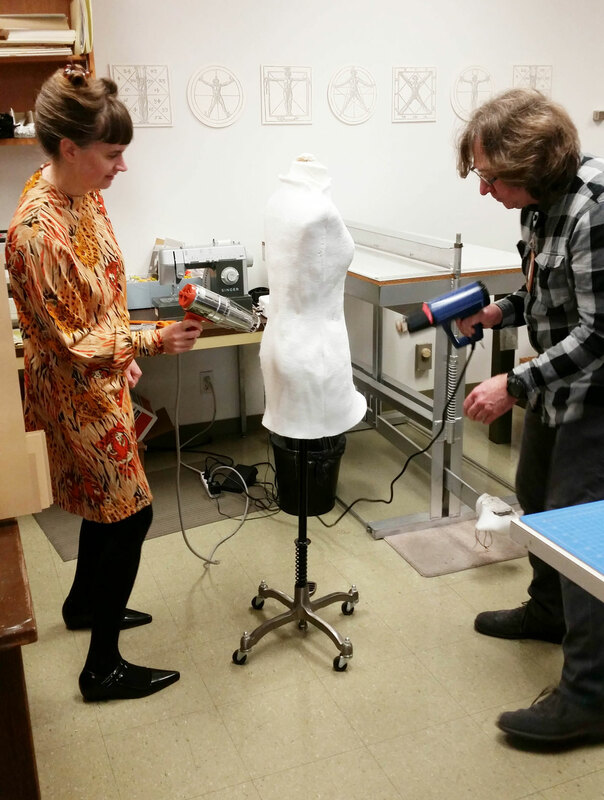 This allows the shoulder support to be placed inside the suit without obstruction and refitted once the suit is ready to hang. 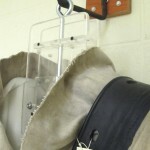 The neck panel also has an adjustable swiveling eyebolt that provides easy attachment when transporting, hanging, and exhibiting. The Ethafoam padding goes well beyond the shoulder seams of the suit and gives support across the entire upper half of the shoulders and well into the arms to reduce weight pulling on the shoulder seams of the suit. The width of the hanger from front to back completely supports the neck’s thick vulcanized collar, as well. 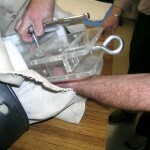 The hanger can readily be taken apart and modified for future adjustments or additions. One possibility being considered is the addition of fabric straps from the main body of the hanger to the interior of the waist for further support. The hanger is unobtrusive in appearance but can also be covered easily for exhibition purposes. It is, of course, important that the stabilizing support that extends from the wall be securely mounted to ensure adequate support to the weight of the suit. This article originally appeared in the January 2012 issue of the Western Association for Art Conservation newsletter. Video: What do costumes reveal about a film character? 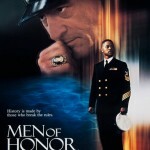 “Men of Honor” promotional poster from the Robert De Niro collection. 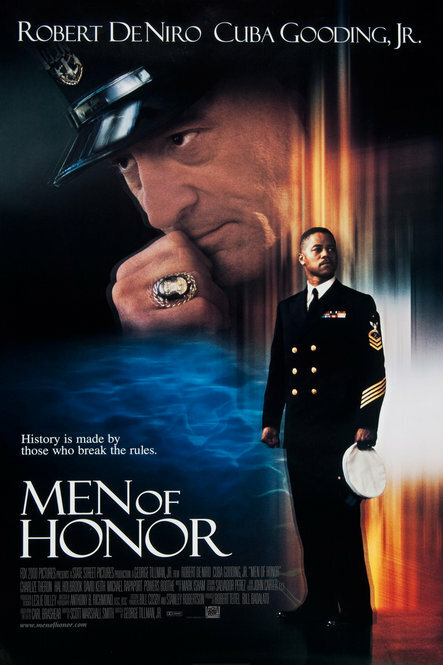 The Robert De Niro collection, which was donated to the Ransom Center in 2006, includes the costume that was worn by Cuba Gooding, Jr. in the movie “Men of Honor” (2000). Photo by Pete Smith. 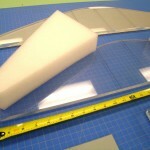 After taking measurements of the suit, the acrylic sheet panels and polyethylene foam pieces are cut to size using a pattern fashioned from blue board. Photo by Wyndell Faulk. Polyethylene foam is archival, lightweight and flexible, which makes it the perfect product to use for this project. 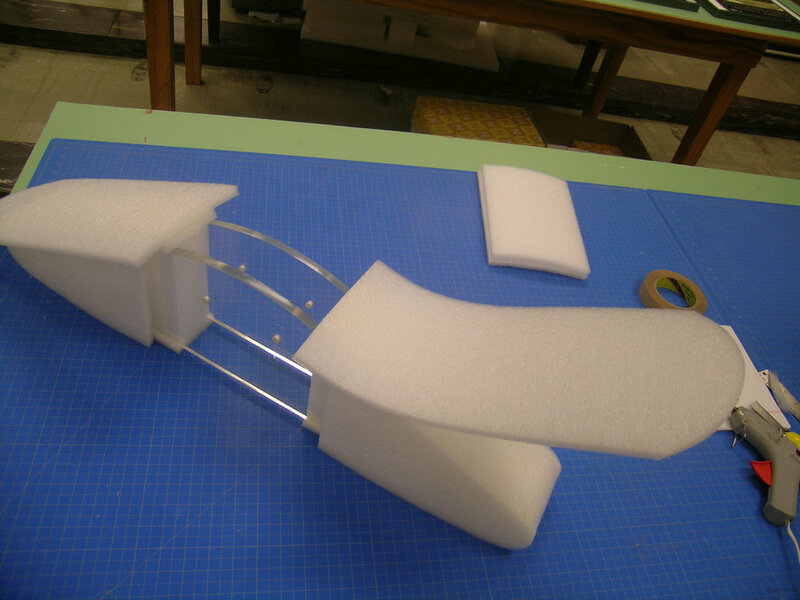 Adding it to the outside of the hanger protects the suit and is support padding for the shoulders. Photo by Wyndell Faulk. The hanger measures over thirty inches in length and is designed to be unobtrusive so the viewer’s focus remains on the suit itself during exhibitions. Photo by Wyndell Faulk. 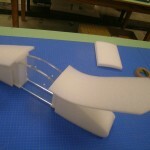 The construction of the hanger allows the center section to be removed and adjusted in order to fit the hanger inside the suit with ease and create a proper fit. Photo by Sonja Reid. 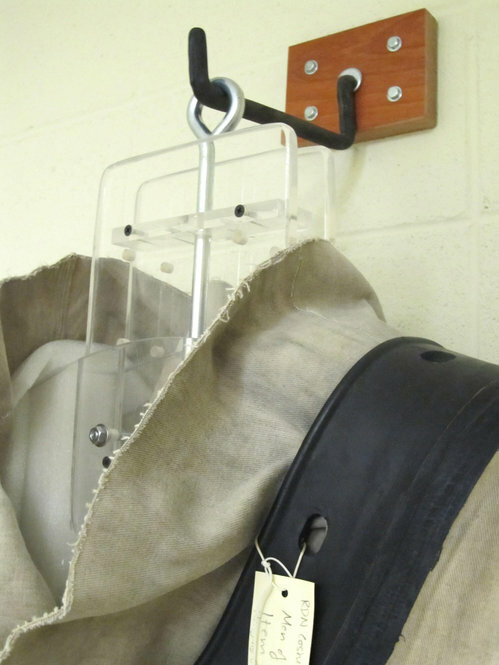 A special wall-mounted bracket is used to support the weight of the suit plus all its accoutrement, such as the weight belt when used in exhibitions. Photo by Wyndell Faulk. The suit is so heavy that it must be placed horizontally in order to get the hanger inside. Photo by Sonja Reid. 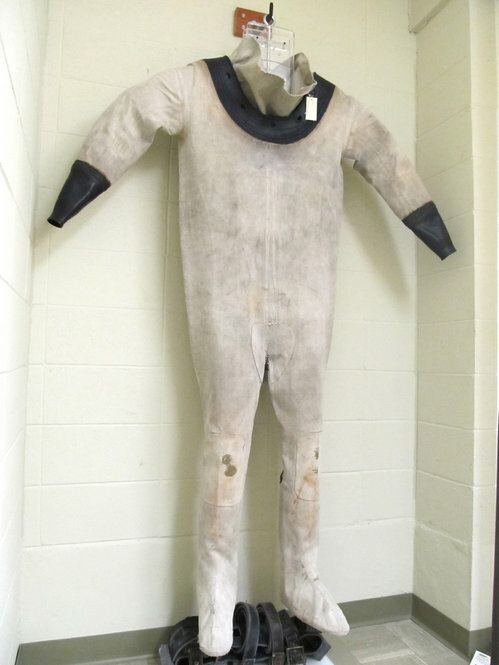 Once hanging, the suit doesn’t touch the walls or the floor, which helps preserve the material. Photo by Wyndell Faulk.